01 First, make the rub for the chicken by finely grinding all the ingredients in a pestle and mortar. 02 Make the herb butter by finely chopping the tarragon, holding back one sprig for later. Zest half the lemon. Add the chopped tarragon and lemon zest to the butter along with the salt and pepper. Mix until the butter is well combined, then roll into a cylinder-shape and refrigerate until firm. 03 Cut two rounds from your roll of butter, then using your fingers, carefully feed the butter between the skin and meat of the raw chicken. Take extra care not to tear the skin. 04 Lightly oil the exterior of the chicken and coat evenly with the rub. 05 Half fill the cup in the center of the GBS Poultry Roaster with the dark stout beer. Add the garlic and the remaining sprig of tarragon. 06 Firmly sit the chicken on the GBS Poultry Roaster cup, making sure the bird is stable and upright. Cut a wedge from the remaining lemon and plug the neck cavity of the chicken. This will keep the steam inside the chicken and stop it from escaping. 07 If desired, a selection of lightly oiled and seasoned baby root vegetables can be added to the poultry roaster at this point, around the outside of the chicken. 08 Prepare the barbecue for indirect heat, approx. 180 °C. Place the chicken over the area of indirect heat and close the lid. Roast the chicken for around 1 hour 10 minutes, or until the core temperature of the meat has reached 75 °C. 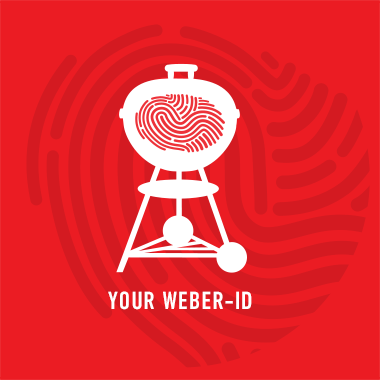 You can check this with a Weber Instant- Read or iGrill thermometer. 09 Allow the chicken to rest for 10 minutes before carving.